New Jersey Future engages businesses, municipal and state officials, environmental groups, other non-profit organizations, and concerned citizens collaboratively to revitalize New Jersey’s cities and towns, protect the state’s open spaces, provide a wider, more affordable range of housing choices for all residents, and expand transportation options. A donation of $500 or more will qualify you as a business member for one year. All contributions are used to support our policy initiatives, research and education efforts, which promote long-term sustainable growth and prosperity in New Jersey. Please consider joining us! 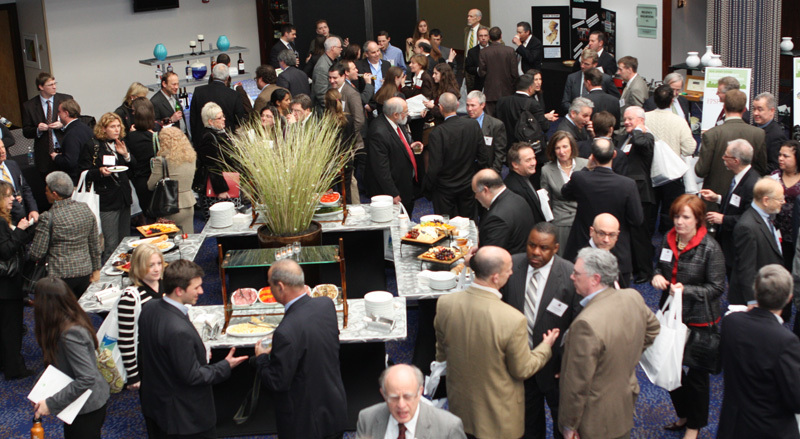 Event Discounts: Receive special sponsorship offers and discounted pricing for your employees to New Jersey Future professional events, including the Redevelopment Forum and Smart Growth Awards. Recognition: Listing on New Jersey Future’s website with a hyperlink back to your website. Networking: Special invitation to networking, meet-and-greet and social events. Industry Insights E-newsletter: Upon request, you and your colleagues will receive What We’re Reading — a daily roundup of news and information about growth, development, planning, transportation and preservation in the Garden State. Expertise: Opportunity to view select research reports before they are released publicly and to request a hard copy when available. A number of great sponsorship opportunities exist for our signature events, including the annual Redevelopment Forum and Smart Growth Awards. Sponsorship of an event at $2,500 or more qualifies you as a business member for one year. AECOM Tishman has delivered many of the most globally recognized, iconic buildings, defining the skylines of the world’s most notable and recognized cities. Atlantic City Electric, a public utility owned by Exelon Corporation, provides safe, reliable and affordable regulated electric delivery services to approximately 550,000 customers in southern New Jersey. Bank of America is one of the world’s leading financial institutions, serving individual consumers, small and middle-market businesses, and large corporations with a full range of banking, investing, asset management and other financial and risk management products and services. Bijou Properties designs, develops and manages the highest quality sustainable buildings in Hoboken, New Jersey. Clean Earth is one of the largest specialty waste companies in the United States, providing remediation, disposal, recycling and beneficial reuse solutions for contaminated soil, dredged material, drill cuttings, and hazardous and non-hazardous wastes. CPC is a leading nonprofit affordable housing and community revitalization finance company. Conifer is a nationally-ranked, full-service real estate company specializing in the development, construction, management and ownership of high-quality, affordable housing communities. Conifer currently owns and manages more than 14,500 multi-family units in over 225 apartment communities. Established in 1938, Connell Foley is a full-service law firm with 130 lawyers and seven offices across the Mid-Atlantic region. The firm’s goal is to provide clients with outstanding legal counsel while maintaining a culture predicated on client service and teamwork. Dewberry is a leading, market-facing firm with a proven history of providing professional services to a wide variety of public- and private-sector clients. Dewberry puts its clients at the center of everything it does, helping them transform their communities and improve quality of life. Edison Properties has been a real estate leader for more than 57 years. Edison owns over 3 million square feet of property in Manhattan and Brooklyn and an additional several million square feet in Newark, Baltimore and other major cities. The Bloustein School seeks to improve our increasingly urbanized and interconnected world by exploring planning approaches and public policy solutions that are healthier, greener, fairer, and generate greater prosperity than do current practices. Florio Perrucci Steinhardt & Cappelli, LLC is a full-service law firm with offices strategically located throughout New Jersey, Pennsylvania and New York. Founded over 25 years ago, Genova Burns represents many of the premier companies and business interests in its region. Greenbaum, Rowe, Smith & Davis is a recognized leader among New Jersey law firms, with deep roots in the state and far-reaching knowledge of New Jersey legal issues. Their team understands the “ins and outs” and inherent complexities of handling legal challenges in New Jersey. Building communities since 1933, H2M is a multi-disciplined professional consulting and design firm with a long history of client service and meeting tough architectural, engineering, and environmental challenges head-on. Hackensack Meridian Health’s mission is to provide the full spectrum of life-enhancing care and services to create and sustain healthy, vibrant communities. Harvard Development Renewal Associates is the LLC formed to redevelop the historic Art Deco Harvard Printing building into mixed-income housing and a convenient parking amenity adjacent to the Highland Avenue train station in Orange. Hollister Construction Services is a preeminent full service commercial construction firm headquartered in Parsippany, NJ. The Howard Hughes Corporation’s mission is to be the preeminent developer and operator of master-planned communities and mixed-use properties. The Howard Hughes Corporation creates timeless places and extraordinary experiences that inspire people while driving sustainable, long-term growth and value for shareholders. Incorporated in 1947, the Hugo Neu Corporation is a privately held company with deep experience in investing, building and managing businesses in recycling, real estate and related industries. Ironstate is a developer, owner, and manager of innovative, large-scale real estate developments in New York and New Jersey. Kitchen & Associates provides architecture, engineering, planning, interior design and energy consulting services with a focus on creating positive and sustainable social, economic and cultural benefits in the communities and neighborhoods they serve. Founded in 1856, M&T Bank Corporation is a regional financial services company with more than $120 billion in assets. M&T Bank provides banking, insurance, investments, mortgage and commercial financial services through more than 800 branches, 1600 ATMs, and a variety of online and mobile services. Maraziti Falcon, LLP focuses its practice in the areas of redevelopment and environmental law, climate change resiliency, government, land use, construction law, and complex litigation, including appeals. Since its founding in 1982, Marchetto Higgins Stieve Architects has orchestrated award-winning architectural, planning, and design services for a long list of residential and mixed-use developments. Mueller Water Products, Inc. is a leading manufacturer and marketer of products and services used in the transmission, distribution, and measurement of water in North America. Established in 1987 to oversee one of the first Special Improvement Districts (SID) in New Jersey, New Brunswick City Market, Inc. is a privately funded 501(c)(3) non-profit organization dedicated to promoting the central business district. New Jersey American Water is the largest water and wastewater service provider in the state, serving approximately 2.7 million people in 190 communities. New Jersey American Water has been providing high-quality, reliable service to customers statewide for more than a century. The New Jersey Housing and Mortgage Finance Agency (HMFA) is dedicated to increasing the availability of and accessibility to safe, decent and affordable housing for New Jersey families. New Jersey Natural Gas is the principal subsidiary of New Jersey Resources, a Fortune 1000 company. New Jersey Natural Gas provides reliable energy and natural gas services including transportation, distribution and asset management, while also investing in and maintaining an extensive infrastructure to support future growth. The New Jersey Redevelopment Authority (NJRA) is a multi-million dollar independent financing authority created by the state of New Jersey via the New Jersey Redevelopment Act in July 1996 to transform urban communities through direct investment and technical support. Nexus Properties is a family-owned and -operated real estate development and property management company that has financed, developed, built, leased and managed a wide variety of properties throughout New Jersey. Nishuane Group is a planning firm dedicated to planning better communities. NJM is New Jersey’s leading workers’ compensation carrier and among the leaders in personal and commercial auto and homeowners insurance. In addition to its legacy of dividends, the Company is known for its nationally recognized customer service. Pennoni, founded in 1966, is a multidisciplinary firm with a breadth of services including civil/site, construction services, environmental, geotechnical, landscape architecture and planning, MEP, structural, survey and geomatics, transportation, water resources, and water/wastewater. Pennrose is a premier real estate development and residential property management company with a custom approach and deep commitment to its residents, investors, owners and personnel. For more than 160 years, PNC has provided a wide range of services for all customers, from individuals and small businesses to corporations and government entities, to help them meet their financial goals. With operations in the United States, Asia, Europe and Latin America, Prudential provides customers with a variety of products and services, including life insurance, annuities, retirement-related services, mutual funds and investment management. PSEG, New Jersey’s largest provider of electric and gas service, owns and operates a diverse fleet of power plants and solar energy facilities throughout the region. With a rich history of New Jersey-focused litigation and business experience, as well as a dedicated team that includes former key state government officials, Riker Danzig has a unique understanding of the intricacies of the state’s legal system. Founded in 1986, RPM is one of the leading developers of affordable housing in New Jersey. RPM has developed residential communities that are home to thousands of New Jerseyans and represent hundreds of millions of dollars in community investment across the state. RWJBarnabas Health is New Jersey’s largest integrated health care delivery system, providing treatment and services to more than three million patients each year. Founded in 1988, Scarinci Hollenbeck is a regional alternative to a National 250 law firm. With over 60 experienced attorneys and offices in New Jersey, New York City and the District of Columbia, Scarinci Hollenbeck serves the niche practice areas most often required by institutions, corporations and entities. SJP Properties employs a deep understanding of the development process and capital markets to create dynamic commercial, residential and mixed-use environments of the highest quality. This goal is achieved through intense and sustained collaboration with project partners and stakeholders. As one of the nation’s leading environmental companies, SUEZ provides water and waste recycling services to over 7.5 million people in the United States and Canada. Valley National Bank operates 209 branch locations in northern and central New Jersey, the New York City boroughs of Manhattan, Brooklyn, Queens and Long Island, and Florida. Helping communities grow and prosper is the heart of Valley’s corporate citizenship philosophy. Van Note-Harvey Associates, Inc. is a full-service consulting engineering, environmental, planning, and land surveying organization tracing its origin back to 1894. Wilentz, Goldman & Spitzer is one of the largest law firms in America, representing clients in areas such as class actions, consumer fraud, criminal law, employment law, family law, personal injury, trust and estates, and workers’ compensation.